> Read more from Judith. Culture transformation is an advanced leadership skill. The primary way to change a culture is to use your Conversational Intelligence to create an environment that infuses energy and commitment into relationships, teams, and the whole organization. Too often we get stuck in habit patterns of ‘talking about’ change but not creating change. The more we talk about change, the more we talk about all the problems and challenges that can emerge — and we fall into negative mindsets which trigger “fear hormones” and “threat networks” in our brains. No wonder change is so difficult. By the time we are ready to take action we are frozen in place. 1st Success Factor: The first skill is be the change for transforming the culture. Realize you have the power, influence and the ability to see and understand the culture in which you work, and to see how you can play a role in transforming it into a healthier, more inspiring, and thriving culture. Transforming culture can mean a culture that is so powerful it transforms itself or it can mean that you play a role in activating the culture transformation. >>Call to Action: Envision how you can play a catalytic role in transforming your culture. Envision how you can be accountable for co-creating transformation in your culture by the way you show up at work everyday. When you put skin in the game, you become the change that transforms the culture. 2nd Success Factor: The second skill, embrace the opportunity, is the ability to step out of your Comfort Zone and rather than allowing fear of the unknown paralyze you, embrace the opportunity with excitement and enthusiasm. Your shift in focus will create positive ripple effects on those you influence. By fully stepping out of your comfort zone and into a new opportunity – you are activating your ability to transform yourself, and also to inspire courage in others. >>Call to Action: Embracing opportunity both ‘encourages’ others and ‘inspires courage’ in yourself and others. By seeing transformation and change as a way to grow you have an influence on how you experience the challenge in a positive and less fearful way. 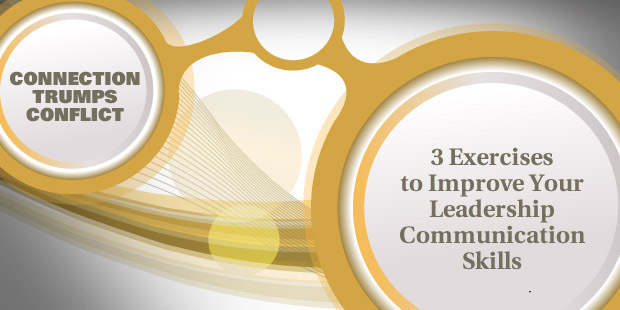 3rd Success Factor: The third skill, create space for conversations, is the ability to intentionally open up opportunities for feedback-rich conversations one-on-one, within teams and across the organization. By opening up space for and creating Conversational Journeys, you create an environment in which employees have room to learn, grow, and be nourished by new ideas and energy. >>Call to Action: Creating spaces is a call to action you need to take every day to open the space for more innovative, generative, and catalytic conversations to take place in your relationships and teams. This space ‘signals our brain’ that we can share and discover around new ideas we’ve never talked about before. 4th Success Factor: The fourth skill, practice Co-creating Conversations ® is a core to Conversatioanl Intelligence. In the previous steps, you learned to recognize and release old baggage filled with toxic experiences that negatively undermine and denigrate relationships, and replace them with new meanings that positively uplift and inspire relationships – empowering a new sense of optimism and effectiveness. As a leader, you can begin to have “co-creating conversations.” Co-creating conversations are conversations that have the ability to release the past and open space for the future with others. a psychological state of being that is powerful and transforms us. >>Call to Action: Co-creating conversations means opening the space for new energy for co-creation with others. This is a space where you and others are open to think about what you don’t know, what you don’t know you don’t know, and to explore possibilities that you never thought about before. 5th Success Factor: And, finally, there is the fifth skill of shaping stories. Having moved from a place of understanding, to challenging, to stepping out and releasing, to opening space for Co-creating Conversations, you have now mastered the most proactive and intentional skill of shaping the story of your team’s collective success. This is what visionary leader and organizations do. It’s work you do with others, no on your own in isolation. And what you co-create together are “shared stories for success” that envision and make possible the fulfillment of WE. >>Call to Action: Shaping stories, is a call to action to realize how you shape the stories impact how the future unfolds. Reflect every day in a conscious way on how you shape stories so that they are winning, inclusive, and appreciative. These conversations have the ability to reframe your view of the world, give you and others hope for the future, and that enable you to see the best outcomes for all of us. Both meanings have the power to transform. Empowering your team to work in concert to achieve your organizations goals and strategies requires flexibility of thought, agility of mind, and speed of response. Most of all, it requires you to break out of old conversational habits and negative patterns of communicating and view the impact you can have on your business in totally new ways. Use conversational intelligence as a way to break from the past and create the future. Rather than thinking about situations as problems, think of them as challenges and opportunities, and communicate this point of view in your conversations with others. Until you challenge yourself to change old thinking and old conversational habits, you will see little change from yesterday to today. Once you do – you will find you become a catalyst for change where ever you go and you will discover new energy appears around you for tackling big challenges and achieving the desired results and targets regardless of their size and difficulty. 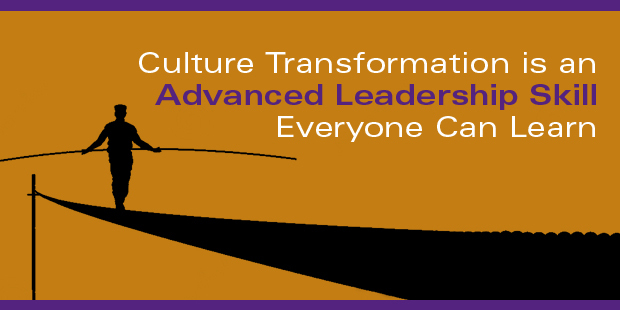 Culture transformation is an advanced leadership skill. The primary way to change a culture is to use your conversational intelligence to create an environment that infuses energy and commitment into relationships, teams and the whole organization. Too often we get stuck in habit patterns of talking about but not creating change. The more we talk about change, the more we talk about all the problems and challenges that can emerge, resulting in negative mindsets, which trigger fear hormones and threat networks in our brains. No wonder change is so difficult. By the time we are ready to take action, we are frozen in place. 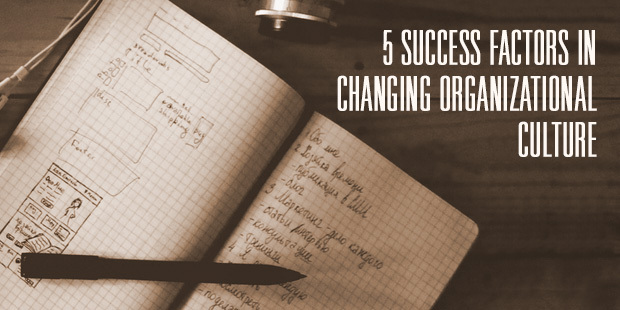 However, you can shift the way you think about change the same way successful leaders do to navigate their own journeys. The first skill is to be the change for transforming the culture. Realize that you have the power, influence and ability to see and understand the culture in which you work, and how you can play a role in transforming it into a healthier, more inspiring and thriving culture. Transforming culture can mean a culture that is so powerful it transforms itself, or it can mean that you play a role in activating the culture transformation. Call to Action: Envision how you can play a catalytic role in transforming your culture. Envision how you can be accountable for co-creating transformation in your culture by the way you show up at work every day. When you put skin in the game, you become the change that transforms the culture. The second skill, embrace the opportunity, is the ability to step out of your comfort zone and, rather than allowing fear of the unknown paralyze you, embrace the opportunity with excitement and enthusiasm. 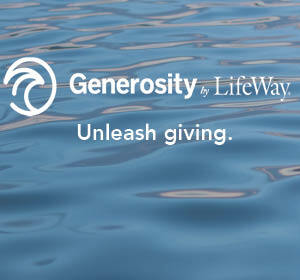 Your shift in focus will create positive ripple effects on those you influence. By fully stepping out of your comfort zone into a new opportunity, you are activating your ability to transform yourself and inspire courage in others. Call to Action: Embracing opportunity both encourages others and inspires courage in yourself. By seeing transformation and change as a way to grow, you influence how you experience the challenge in a positive and less fearful way. The third skill, create space for conversations, is the ability to intentionally open up opportunities for feedback-rich conversations one-on-one, within teams, and across the organization. By opening up space for and creating conversational journeys, you establish an environment in which employees have room to learn, grow and be nourished by new ideas and energy. Call to Action: Creating spaces is a call to action you need to take every day to open the space for more innovative, generative and catalytic conversations to take place in your relationships and teams. This space signals our brain that we can discover and share new ideas we’ve never talked about before. The fourth skill, practice co-creating conversations, is a core to conversational intelligence. In the previous steps, you learned to recognize and release old baggage filled with toxic experiences that negatively undermine and denigrate relationships, and replace them with new meanings that positively uplift and inspire relationships. This empowers a new sense of optimism and effectiveness. As a leader, you can begin to have co-creating conversations. Co-creating conversations are conversations that have the ability to release the past and open space for the future with others — a psychological state of being that is powerful and transforms us. Call to Action: Co-creating conversations means opening the space for new energy for co-creation with others. This is a space where you and others are open to think about what you don’t know, what you don’t know you don’t know and to explore possibilities that you never thought about before. Finally, the fifth skill is shaping stories. Having moved from a place of understanding to challenging, then stepping out and releasing, and finally opening space for co-creating conversations, you have now mastered the most proactive and intentional skill of shaping the story of your team’s collective success. This is what visionary leaders and organizations do. It’s work you do with others, not on your own in isolation. What you co-create together are shared stories for success that envision and make possible the fulfillment of WE. Call to Action: Shaping stories is a call to action that allows you to realize how you shape the stories’ impact on how the future unfolds. Reflect every day in a conscious way on how you shape stories so that they are winning, inclusive and appreciative. These conversations have the ability to re-frame your view of the world, give you and others hope for the future and enable you to see the best outcomes for all of us. Both meanings have the power to transform. Empowering your team to work in concert to achieve your organization’s goals and strategies requires flexibility of thought, agility of mind and speed of response. Most of all, it requires you to break out of old conversational habits and negative patterns of communicating and view the impact you can have on your business in totally new ways. Use conversational intelligence as a way to break from the past and create the future. Rather than thinking about situations as problems, see them as challenges and opportunities, and communicate this point of view in your conversations with others. Until you challenge yourself to change old thinking and conversational habits, you will see little change from yesterday to today. Once you do, you will find you become a catalyst for change wherever you go, and you will discover new energy appears around you for tackling big challenges and achieving the desired results and targets regardless of their size and difficulty. >> Read more from Judith. 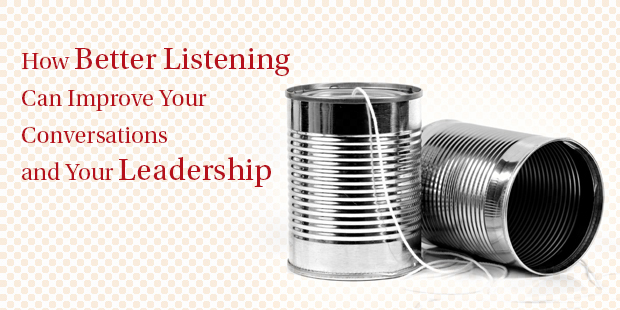 For a leader, listening is perhaps the most important skill of all. As a leader, we must learn to listen while navigating along with the person speaking toward a common destination – mutual understanding. 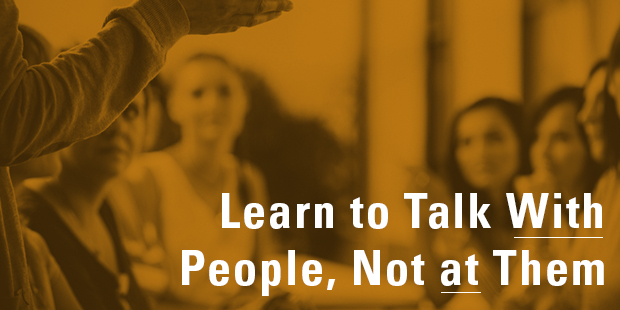 Whether your talents are in sales, systems engineering, administration, technical support, or leadership, listening to connect with others – requires a new and powerful form of deep listening. When having a conversation you can improve your precision listening skills by asking questions that will help you gain more insight from the speaker. By intentionally navigating through a conversation, we can move from making assumptions to gaining clarification of meaning and intent – and it happens by asking the right questions. Judith Glaser, CEO of the Benchmarking Institution and Chair of the Creating WE Institute, has developed examples of these navigational-listening questions that will guide your next important conversation. You can download these questions along with other practical helps for your next conversation here. A recent release of our SUMS free book summaries also spoke directly to this topic. 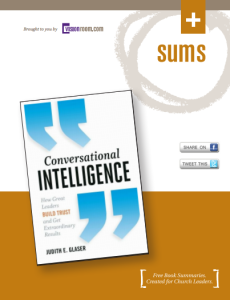 Conversational Intelligence, also by Judith Glaser, advances the theory that the key to success in life and business is to become a master at “Conversational Intelligence.” It’s not about how smart you are, but how open you are to learn new and effective powerful conversational rituals that prime the brain for trust, partnership, and mutual success. 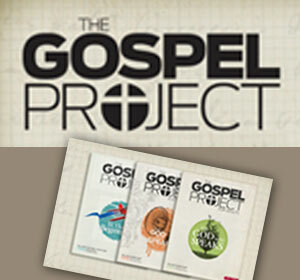 Download a copy of this free summary here. >> Tip 1: Prime your brain with trigger words. 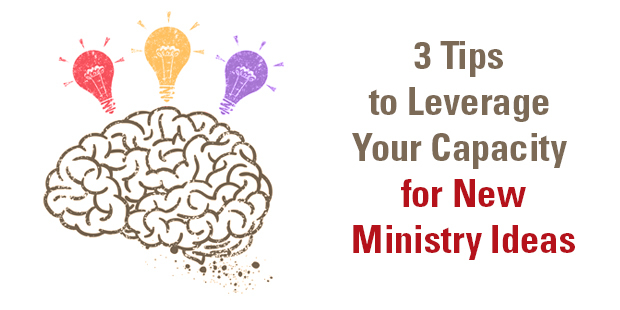 We need to prime our brains to freely generate and express ideas, not suppress them. So, state the problem or challenge you are working on. Find trigger words related to your challenge to get your juices flowing. Sleep on it, watch a movie, and go to a park. Give the body something to do while the mind wanders freely. Then put yourself to work. >> Tip 2: Think of the worst idea. Remove the fear of making mistakes, feeling stupid or safe or receiving negative feedback. No idea is a bad idea. In fact, research shows that what appears after ‘the worst idea’ can become a trigger for the best ideas no one has thought of before. >> Tip 3: Let it flow. Don’t wait for inspiration or settle for perfect solutions. Instead, generate a wealth of ideas with others. When you’re inclined to stop, or judge your ideas, keep going. Don’t get caught in your usual patterns and instead open up your mind to a ‘non-judgmental’ state where your ideas and others’ ideas can connect. If you are feeling anxious, uncomfortable, or lost in uncharted territory, know you are on the right track. > Read more from Judith here. 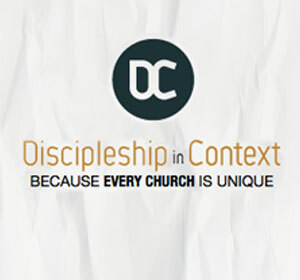 Does Your Leadership Structure Impede the Progress of Discipleship? Effective leaders shoulder a lot of responsibility. They are responsible to shareholders for financial results. They are responsible to clients for quality and service. And they are responsible to employees for guidance, support and recognition. Mangers are presented with a leadership crossroads when asked to balance external expectations with anticipated results. It can be stressful; even the best of us sometimes shift from coaching and supporting to anger, judgment and blaming. But there’s a better way for leaders to deliver results and strengthen relationships than exerting tighter control, conveying disappointment, or taking over projects that have failed to meet targets. How? Get closer to your team, engage it in problem solving, be transparent, and share your concerns. Anger activates our fear networks and releases the hormone and neurotransmitter cortisol, which blocks access to areas of the brain that govern advanced thought processes like strategic thinking. Fear engages the amygdala, the primitive part of our brain responsible for memory and emotional reactions, which triggers a “fight or flight” response. A leader whose actions provoke fear in others may unwittingly shut down team members’ creative and strategic capacities. Healthy relationships serve to release oxytocin, another hormone and neurotransmitter. Unlike cortisol, which closes neural pathways, oxytocin opens up the networks in our executive brain, or prefrontal cortex. Cortisol enables leaders to successfully manage the expectations, motivations and efforts of all stakeholders and to co-create optimal solutions. That allows teams to experiment with new ways of doing business—and to grow together. Manage disappointment by seeking to understand shortcomings without judgment and by enlisting your team in collaborative problem solving. Set goals and expectations with your team. Discover where they want to go and make sure they have an opportunity to weigh in on the plans and commitments they are going to be held responsible for. Make it safe for people to be honest—to freely share their thoughts, concerns and perspectives. Allow others to shine. Hang back, listen up, and let others jump in to take the lead. You might be pleasantly surprised! Leaders that are guided by both their heads and their hearts—and the energy and aspirations of their team—are more likely to optimize outcomes, even in the face of tough challenges and underperformance. It’s not rocket science, it’s neuroscience. 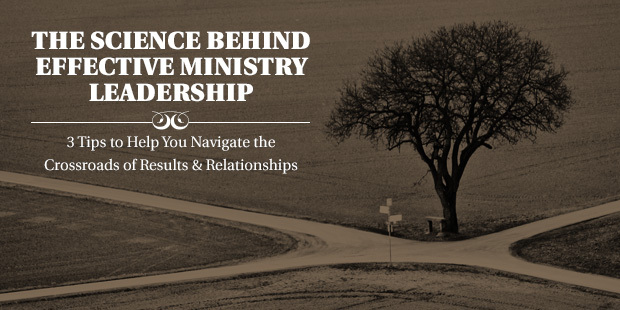 Choose the constructive response the next time you find yourself at a leadership crossroad between results and relationships. Many of us act as though we all see the same reality, yet the truth is we don’t. Human Beings have cognitive biases or blind spots. 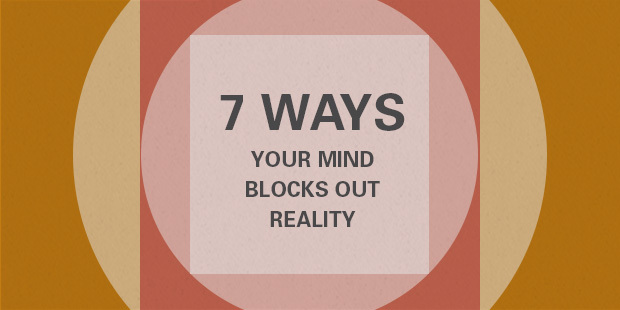 Blind spots are ways that our mind becomes blocked from seeing reality as it is – blinding us from seeing the real truth about ourselves in relation to others. Once we form a conclusion, we become blind to alternatives, even if they are right in front of their eyes. Emily Pronin, a social psychologist, along with colleagues Daniel Lin and Lee Ross, at Princeton University’s Department of Psychology, created the term “blind spots.” The bias blind spot is named after the visual blind spot. There is a classic experiment that demonstrates one level of blind spots that can be attributed to awareness and focused-attention. When people are instructed to count how many passes the people in white shirts make on the basketball court, they often get the number of passes correct, but fail to see the person in the black gorilla suit walking right in front of their eyes. Hard to believe but true! ▪ Ford’s success with the Model-T blinded him to the desires of his customers. That gave the fledging General Motors an opportunity to capture a winning share of the automobile market with a broader range of models and options. ▪ A&P stuck with the grocery chain’s private label products even as their customers defected en masse to supermarkets that carried the national brands they saw advertised on TV. The good news is that companies can recover from denial; even when they seem permanently wedded to their histories, their philosophies, or their belief systems. IBM, which had been caught up in its own “bureau-pathology,” learned to conquer arrogance and overcome its history and culture, under the leadership of Louis Gerstner. Intel, DuPont, and Coca-Cola, are more examples of corporations caught in denial traps when launching new products. They demonstrated that when corporate management has strong convictions, or worse yet, hubris about their points of view, they can become blind to their customer’s needs – needs that are right in front of their very eyes. Seeing the real truth is an art and a science. When we get the balance right between what we think is true and what is really true – we are managing our blind spots with integrity, and wisdom. Fortunately, these well-known brands did not live in denial very long. It was only a passing phase, and they recovered from it by revisiting reality with an open mind. Blind spots explain why the “smartest people in the room” (as Enron’s top executives were famously called) can sometimes be very dumb. They do not see the light – they are not open to changing their minds. Coaching can also help individuals gain a broader and more ‘realistic perspective’ about situations and themselves. Executive, Team and Organizational Coaching can help leaders calibrate with the world around them, giving them reality checkpoints that position them to navigate the real world with wisdom and insight. Denial of Reality – Feeling so strong about our own beliefs that we deny the beliefs of others, or deny facts right in front of our eyes. Control – Seeing ourselves as being more responsible for things than we actually are, or having more control over things and events than we truly do. Made-Up Memories – Making decisions based on memories that did not happen. Often we confuse our imaginations, or our dreams, with reality. Reality Distortions – Distorting reality to conform to preconceptions. Listening Only to Validate What We Know – Failure to listen to others. Undervaluing What We Do Know – Listening too much to others, and allowing others’ beliefs to talk us out of our beliefs; or in some cases cause us not to trust our instincts. Tip #1 – It Takes Thought to Learn. The brain does not always allow us to hear all the facts if they do not fit our prior understanding of a concept. To learn new facts, you must be actively open to accepting opposition. Tip #2 – Effectively Working Together. Partners who were considered controlling were perceived as critical and rude, and their advice was generally rejected and not trusted. When the same partners showed appreciation, a feeling of rapport and trust developed, creating a deep ‘WE-centric’ bond. In situations of high stress, fear or distrust, the hormone and neurotransmitter cortisol floods the brain. Executive functions that help us with advanced thought processes like strategy, trust building, and compassion shut down. And the amygdala, our instinctive brain, takes over. So we default to one of four responses: fight (keep arguing the point), flight (revert to, and hide behind, group consensus), freeze (disengage from the argument by shutting up) or appease (make nice with your adversary by simply agreeing with him). Set rules of engagement. If you’re heading into a meeting that could get testy, start by outlining rules of engagement. These practices will counteract the tendency to fall into harmful conversational patterns. Afterwards, consider see how you and the group did and seek to do even better next time. Read more by Judith here. Have you created a “My Vision Room” account yet? Sign up free here to get insider access to additional features and offers of the Vision Room.